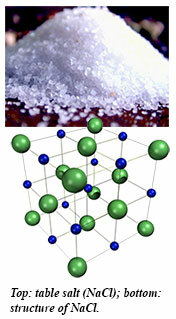 Table salt, sodium chloride, is one of the first chemical compounds that schoolchildren learn. Standard chemistry textbooks say that sodium and chlorine have very different electronegativities and thus must form an ionic compound with a well-defined composition. Sodium’s charge is +1, chlorine’s charge is -1; sodium will give away an electron, chlorine wants to take an electron. According to chemistry textbooks and to common sense, the only possible combination of these atoms in a compound is 1:1, rocksalt NaCl. However, scientists led by professor of theoretical crystallography Artem R. Oganov from the Department of Geosciences of the University of Stony Brook (NY) discovered a family of new materials with different stoichiometries that violate textbook rules, NaCl 3 , NaCl 7 , Na 3 Cl2, Na 2Cl, and Na3Cl. This remarkable finding has been made based on a new methodology for predicting the most stable crystalline and chemical structures of materials fro m the first principles. Following these theoretical predictions, Carnegie’s Alexander Goncharov, who led the experimental efforts, showed that under certain high-pressure conditions, plain old salt can take on some surprising forms that violate standard chemistry predictions and may hold the key to answering questions about planet formation. 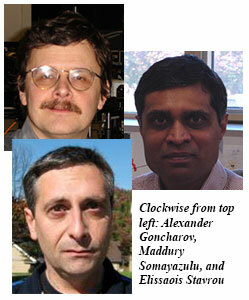 Their work is published December 20 in Science. [W. Zhang et al.,Science 342, 1503 (2013)]. The experimentalists then attempted to verify these predictions, using a diamond anvil to put salt mixed with molecular chlorine or metallic sodium under high pressured. The team, which also included Carnegie’s Elissaios Stavrou and Maddury Somayazulu, among others, performed high-pressure experiments using advanced probes such as synchrotron micro-diffraction and Raman spectroscopy to study the range of changes that simple sodium chloride undergoes under pressure. The research team also included Qiang Zhu, Eddine Boulfelfel, and Andriy Lyakhov of State University of New York Stony Brook; Vitali Prakapenka of the University of Chicago; and Zuzana Konopkova of Photon Science DESY. This work was supported by the National Science Foundation, DARPA, the government of the Russian Federation, China’s Foreign Talents Introduction and Academic Exchange Program, German BMBF, the Young Teachers Development Project in China Agricultural University, the Army Research Office, and EFREE a BES-EFRC center at Carnegie. Calculations were performed on XSEDE facilities and on the cluster of the Center for Functional Nanomaterials, Brookhaven National Laboratory, which is supported by the DOE-BES. X-ray diffraction experiments were performed at GeoSoilEnviroCARS (Sector 13), Advanced Photon Source (APS), Argonne National Laboratory and Petra III, DESY, Hamburg, Germany. GeoSoilEnviroCARS is supported by the National Science Foundation - Earth Sciences and Department of Energy - Geosciences. Use of the Advanced Photon Source was supported by the U. S. Department of Energy, Office of Science, Office of Basic Energy Sciences. PETRA III at DESY is a member of the Helmholtz Association (HGF).